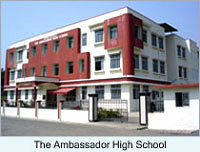 June 2006 the doors of Ambassador High School opened for the first time with enrollment at more than 700. Children from the community are being given a quality education by carefully selected teachers in a loving environment where they are thriving. Included amongst the 700 enrolled are 100 Karuna orphans who transferred from their classes, previously held in garages, to the lovely classrooms of their new school.